September « 2008 « R-V There Yet? It appears that not all hurricane aftermaths are created equal. 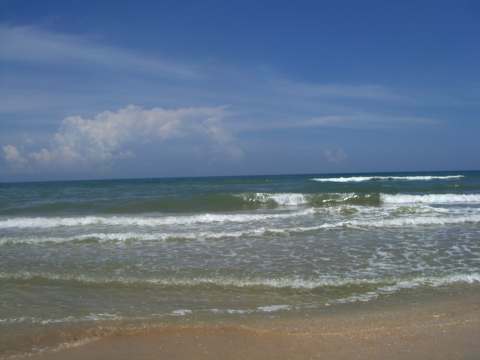 Following hurricanes Dolly, Eduoard and Gustav we made trips to the Padre Island National Seashore (located on Padre Island just south of Corpus Christi) and were greeted with a beautiful beach and crystal clear, 88 degree, water. 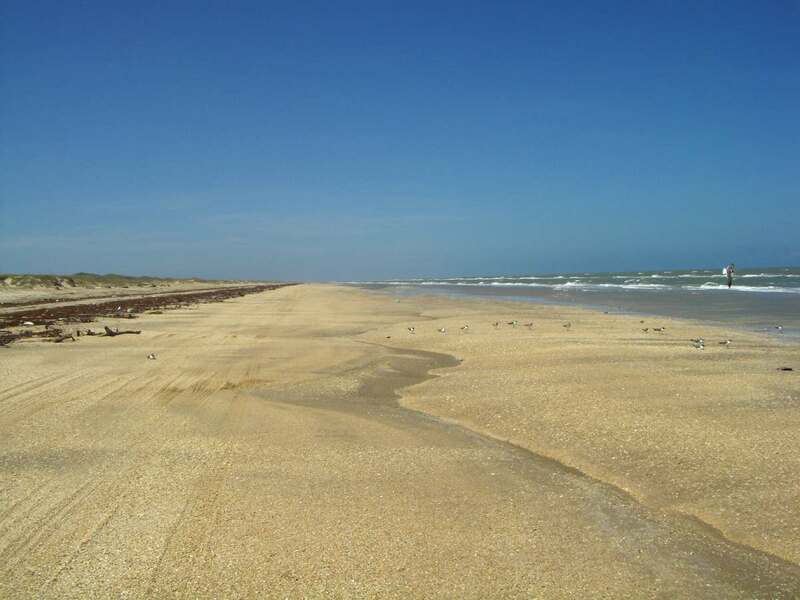 Well, following Hurricane Ike, the beach looked a little different. We drove on the beach for about 7 miles south from the park headquarters. We were amazed at the sight. 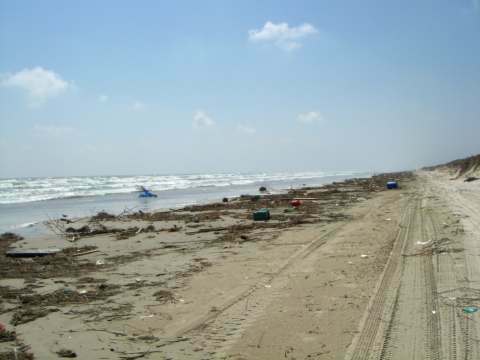 Under an unusually high tide, the beach was filled with trash that had washed up from Galveston over 200 miles to the north. 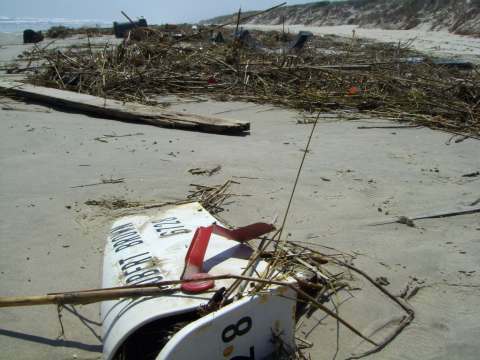 We were told that the beach was closed 15 miles south due to the extreme buildup of debris. We couldn’t believe the number of Rubbermaid style storage tubs, unfortunately there were no lids. 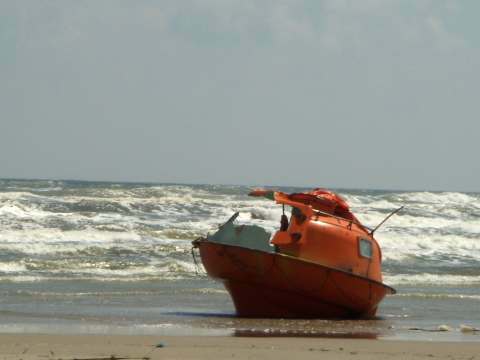 The beach was strewn with coast guard life preservers. Here is one of the over 20 water heaters that we saw. There were barrels of all kinds. 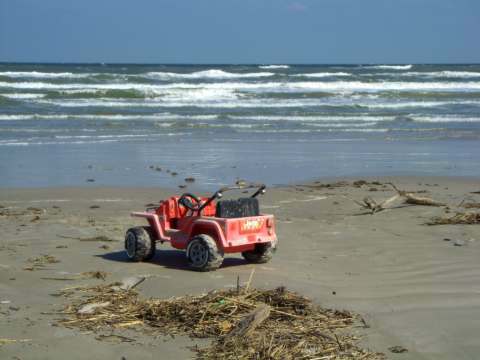 Many were marked as being owned by Texas City and the Galveston Parks Department. 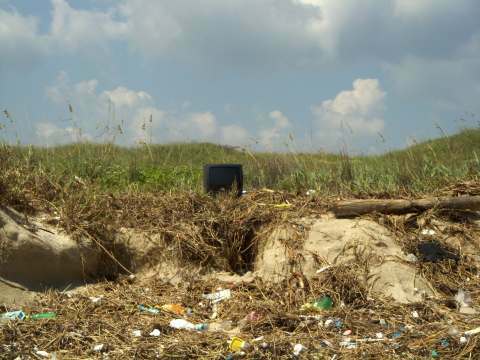 At least 4 televisions and who knew that they would float. Telephone poles were found everywhere. 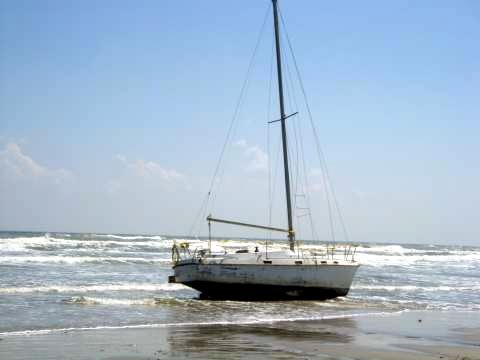 We came across a sailboat that, other than being washed onshore, appeared to have weathered the storm pretty well. 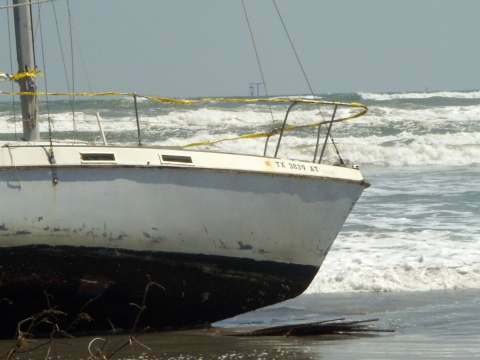 The police had ringed the boat with crime scene tape to protect the vessel until the owner can pick it up. 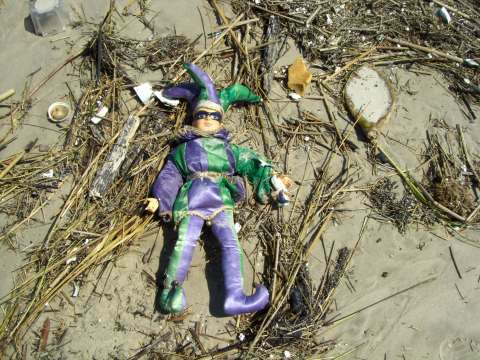 How about a Mardi Gras doll. 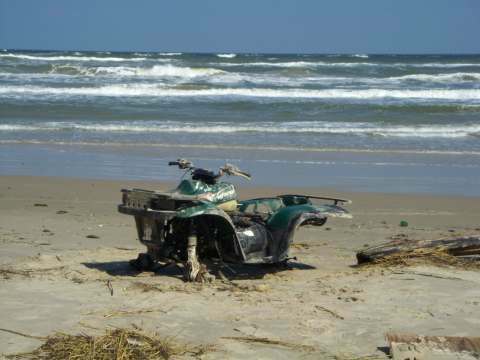 A 4-wheeler that had already been stripped of its wheels. Oil rigs use escape pods as rescue devises. If anyone was aboard this one, they may not have fared very well. The top shell is smashed and half of it is missing. It doesn’t appear that Robert Brown will be receiving mail anytime soon. We found this about seven miles south of the beach entrance. 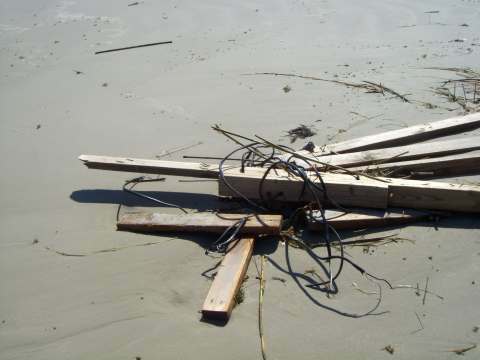 You could build several houses with the lumber that was washed ashore in the area we traveled. There were countless staircases and roof sections. Here are studs and rafters with the wiring still in place. The beach was crawling with scavengers. I’m sure that most of the salvageable stuff had already been removed. When we left the beach we saw more people showing up with trailers for their booty. We plan to go back next week and see how the removal is progressing. Well, we’ve moved on back to Rockport on the central Texas coast. 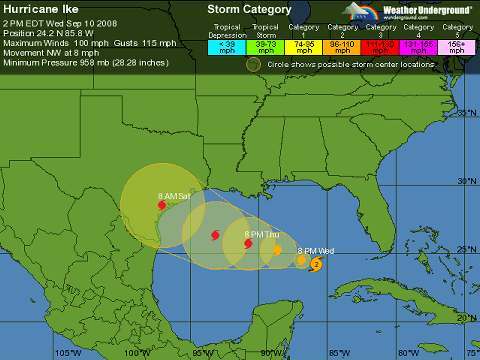 As it turned out, we probably didn’t have to leave the area since Hurricane Ike turned north and hammered Galveston and the Bolivar Peninsula. However, we didn’t want to take any chances. Last year, about this time, we were leaving Florida and overwhelmed by the love-bugs that smash easily on the front of vehicles and destroy the paint. Well, it turns out that love-bugs are pests throughout the Gulf Coast. They are not as dense as you would find in Florida, but they are certainly present near Rockport. As we moved away from the coast, the love-bugs vanished and were replaced by swarms of butterflies all the way to Laredo. They are still messy, but not as destructive as the love-bugs. 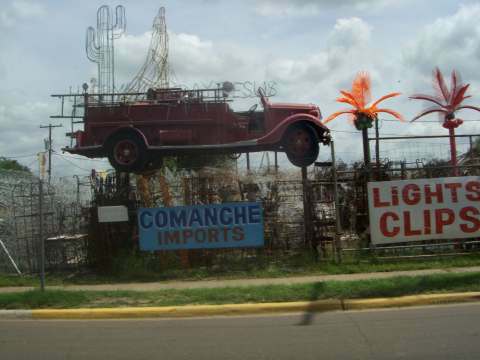 We had considered heading south to South Padre, but settled on going west to Laredo, Texas. 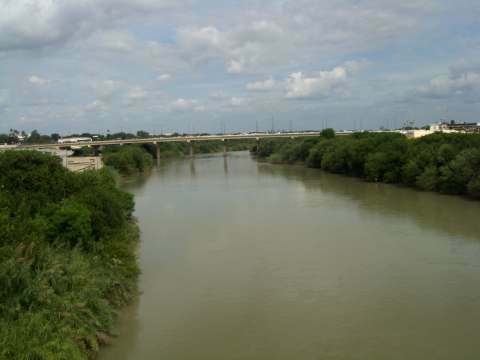 Laredo is located on the Rio Grande, about 180 miles due west of Corpus Christi. We had made arrangements to stay at Lake Casa Blanca State Park. Because we were “evacuees” we were allowed to stay free. There were several people that didn’t get reservations in on time and had to “dry camp”. In other words, find a place in a parking lot and camp without electric or water. Luckily we had 50 Amp service and city water. 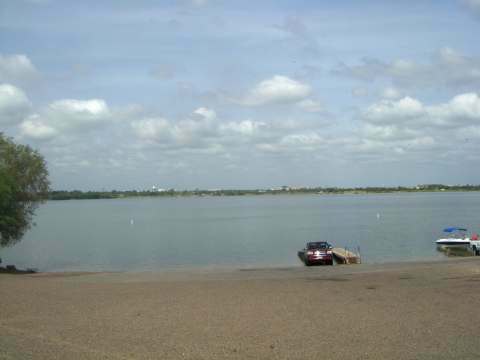 As with most of the state parks, Lake Casa Blanca had large, well maintained RV sites. The park was quite active and has a fishing and swimming lake within its borders. We expected a small, older town. It turns out that there are several new subdivisions to house the beneficiaries of NAFTA, the North American Free Trade Agreement. Interstate 35 terminates at the Mexican border and is a major entry point for goods being moved between Mexico, Canada, and the US. In the older part of town we noticed a variety of businesses selling various crafts. Here’s one with wire statuary. The buildings in the downtown area date back a number of years. 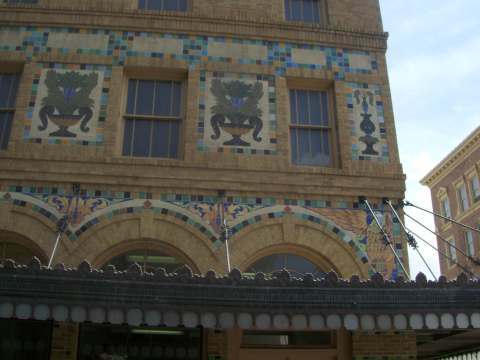 The building on the left has ornate tile-work. 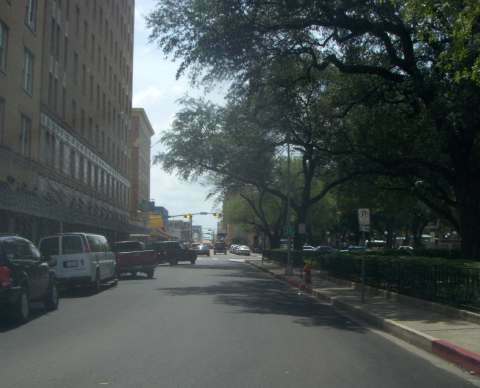 Many of the Laredo streets were obviously designed for horse traffic rather than cars. They are extremely narrow. 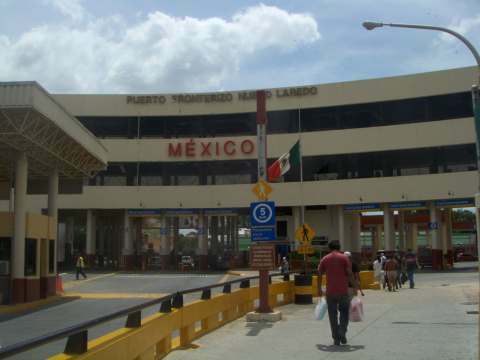 On Friday, we decided to head across the border to Nuevo Laredo, Mexico in the state of Tamaulipas. We parked on the US side and walked across Bridge #1. 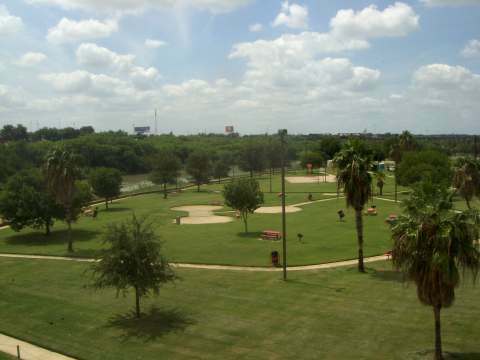 From the bridge we had a nice view of a beautiful riverside park in Laredo. Looking southeast from the bridge we see the Rio Grande and Bridge # 2. On the south end of the bridge we found ourselves at the Mexican Point of Entry. Before we crossed, we asked where the good restaurants were and were told that many of them had closed. 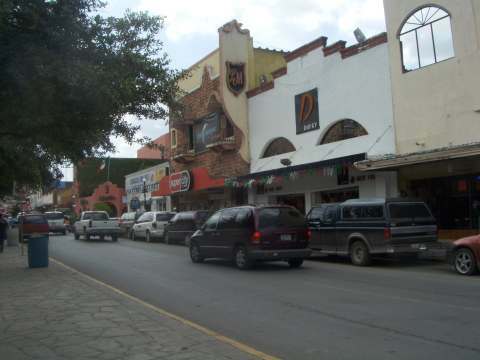 It appeared that the streets were quite busy, but we found no upscale restaurants near the border. Had we arrived a week later the place would have been crammed with people celebrating diesyseis de septembre (September 16th), which is Mexican Independence Day. 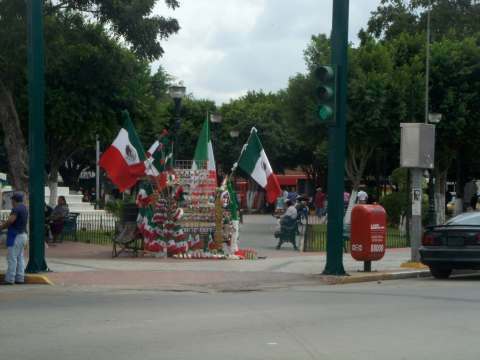 You can see that the vendors in the park were getting prepared for the holiday. 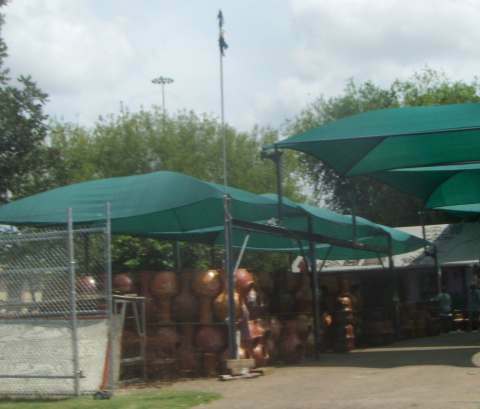 We spent a few hours in Nuevo Laredo and had guacamole and a couple of beers at one of the few restaurants we found. We left Mexico carrying a tube of arthritis cream and a couple of bottles of Bacardi Añejo which is made in Mexico and makes the best rum and cokes. Friday night we found a very good restaraunt, the Palenque Grill, which is located near the state park at 7720 Bob Bullock Loop. The food was excellent. Tinka had the pollo asado and I had the sirloin steak. 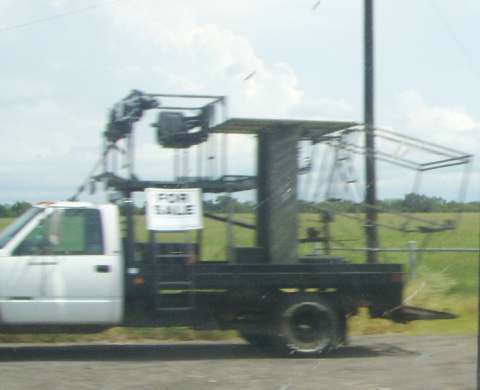 In this area, it appears that the hunters set themselves up in mobile deer stands. 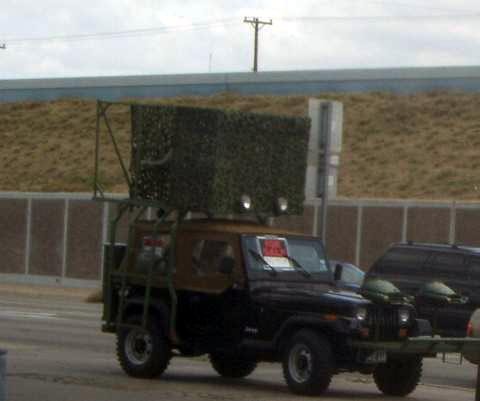 We saw a number of vehicles set up with racks, and seats on the roof. This one gave us an idea for upgrades to our jeep. I especially like the seats mounted to the hood. Sunday we made our uneventful way back to Rockport and were able to set up between rain storms. First things first – Happy Birthday to Tinka’s sister Jenelle!!! We know her birthday was Sunday, and we called her but didn’t get it into a blog. She is thrilled to be another year older. 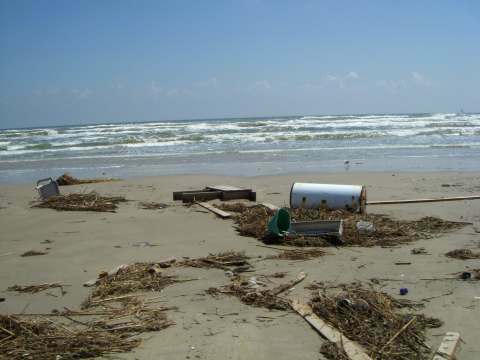 Between 1900 and 1996 there have been 36 hurricane strikes along the Texas coastline. Only 15 of those have been major storms, category 3 or greater. These strikes have been divided with 17 storms along the upper coast, 13 in the southern section and only 6 in the mid-Texas coast where we are located. Averages would say that we might expect a hurricane to strike the Texas coast about once every three years. Well, we hit the jackpot this year with three already. 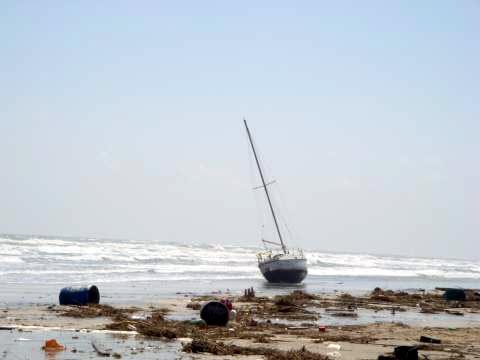 Our first encounter was with Hurricane Dolly that arrived in Texas near South Padre Island. We had left there and moved to near Corpus Christi. 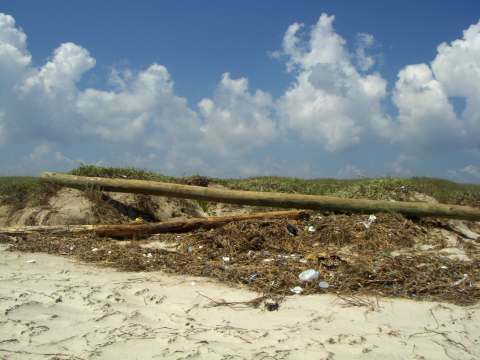 Most people think that hurricanes damage the shoreline. In this case, the reverse is true. The Padre Island National Seashore was impacted by the north side of Dolly. We spend quite a bit of time in the park at a place called Little Shell Beach, located about 20 miles south of the park headquarters. This was the width of the beach prior to Dolly. 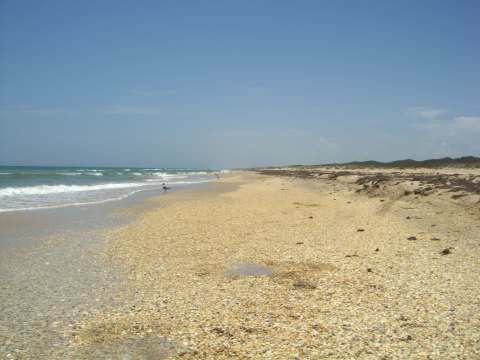 This is how Shell Beach gets its name – click to enlarge. So no, hurricanes don’t always damage the beaches. 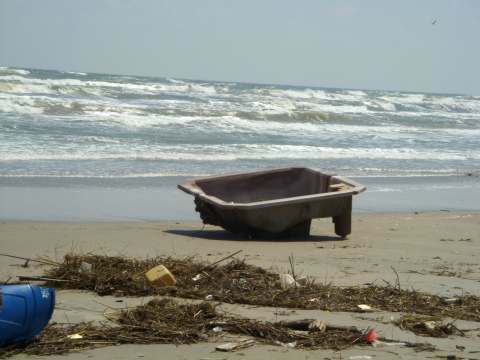 When we were in Galveston, we were inconvenienced again and our travels were chronicled on a recent blog. Now we’re tested once again. We are currently threatened by our latest adversary, Ike. As it leaves Cuba and heads toward the Texas coast, we’re not getting a very clear picture of the proposed path. Best guess sends it directly at us just north of Corpus Christi. Timing will be a little easier to gauge, late Friday or early Saturday and probably a category 3. Hence, WE’RE OUTTA HERE!!! Tomorrow morning we’re packing up and heading west to Lake Casa Blanca State Park at Laredo, TX. 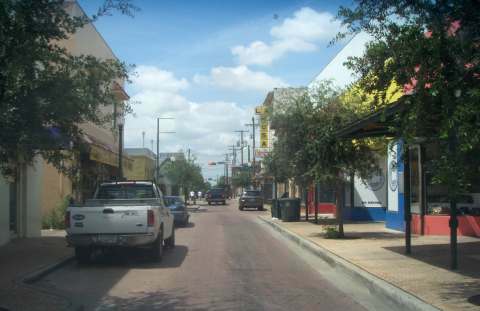 (Laredo is located about 175 miles west of the coast on the Mexican border.) When we checked on availability at the park we found that there were no vacancies unless we were evacuees from the storm. Since we are, we were able to get in, and here’s the best part, free. We’ll keep you posted on our movements. You are currently browsing the R-V There Yet? blog archives for September, 2008.